The big news today is in Colorado. The Colorado secretary of state, Donetta Davidson, has certified that the petition to change the way Colorado allocates its electors has gathered enough signatures to be on the ballot. On Nov. 2, Colorado voters will be asked if they approve a change to the state constitution that divides its nine votes in the electoral college in direct proportion to the popular vote. 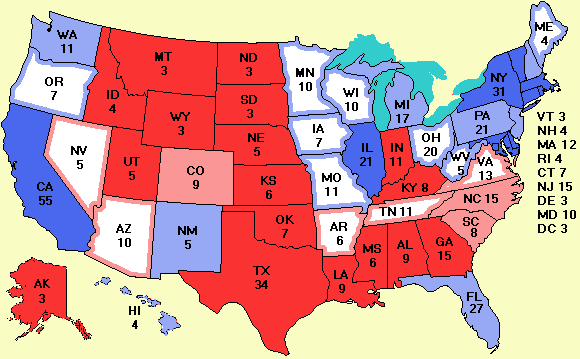 If it fails, George Bush will most likely get all nine electoral votes. If it passes, probably Bush will get five electoral votes, Kerry will get four, and the Supreme Court will get a world-class headache. Badly polarized as it is, the Court probably does not want to decide another election. The legal issue will hinge on the second sentence of Article II, Section 1 of the U.S. constitution, which reads: "Each State shall appoint, in such Manner as the Legislature thereof may direct, a Number of Electors, equal to the whole Number of Senators and Representatives to which the State may be entitled in the Congress..." Nothing forbids the state legislature from appointing the electors any way it wants to. Maine and Nebraska allocate one elector for each congressional district won plus two for winning state wide. In 1876, the Colorado legislature decided to save the taxpayers money and didn't bother having an election at all; it just appointed its three electors itself. The issue the Supreme Court may have to decide in 2004 is whether a state constitution can mandate how electors are apportioned, thus bypassing the state legislature. If the Court wants to veto the state constitution, it can interpret the U.S. constitution literally and say: "Nope. the legislature didn't approve; doesn't count." But on many other occasions the Court has looked for the intent of the founding fathers (founding parents?) and it is clear they meant the states could choose their electors any way they wanted to. In 1789 nobody envisioned statewide referenda on constitutional matters. If you were planning to stay up on election night until the presidential race is decided, bring lots of food and drink; it may take weeks again. By comparison with these great constitutional issues, Bush's 17% lead in a new Survey USA poll in Kentucky is small potatoes. And his 6% lead in a new North Carolina poll is hardly worth mentioning at all. But Electoral Vote Predictor hates to miss a poll, so here they are. No change in the electoral college, however. Kerry maintains his large lead there. But a lot can happen between now and November.